The Dead Sea Scrolls are Coming to Denver! — Eric C. Smith, Ph.D. The Dead Sea Scrolls are Coming to Denver! A portion of a scroll of Isaiah. Image in the public domain, taken from Wikipedia, where it was uploaded by Daniel.baranek. Something very exciting is happening in Denver in 2018! A touring exhibition of some of the Dead Sea Scrolls is coming to town! This is a rare opportunity to see the scrolls in person, and to have the experience of being in the presence of the oldest copies of biblical texts known to exist. 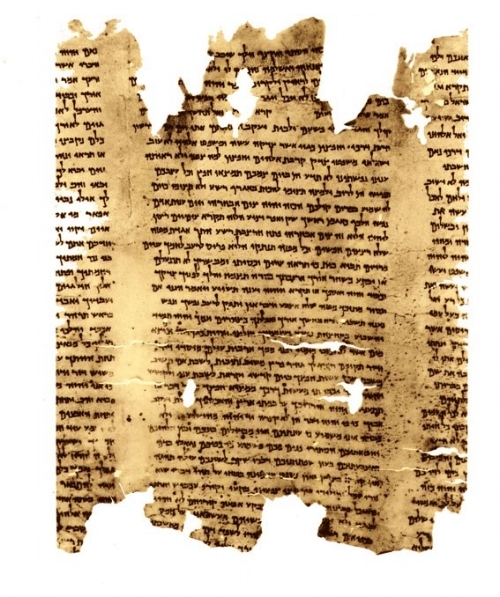 The Dead Sea Scrolls were the marquee archaeological discovery of the 20th century. First discovered in 1946 by a Bedouin who was looking for a lost animal, a series of caves at the ruins of Qumran by the Dead Sea eventually produced thousands of manuscript fragments and other artifacts. The scrolls have revolutionized our understanding of the development of the Hebrew Bible, second-temple Judaism, sectarian identities, and anti-Roman resistance by Jews, to name just a few things. The exhibit is coming to the Denver Museum of Nature and Science March 16th through September 3rd, 2018, and it promises to be a really fantastic experience. I'm available to speak to your congregation to prepare for a visit to the exhibition, so that when you arrive you will have a better sense of what you're looking at. We can discuss the scrolls themselves, the debate over the community that lived at Qumran, the tinderbox social and political environment in which the scrolls were hidden away, and more! Get in touch now so that we can schedule a class or two, and perhaps even go see the scrolls together!